On November 12, 2018 Evanston nonprofit leaders called on the City Council to restore funding for the Mental Health Board. This comes after news that the Mental Health Board was set to receive as much as a $250,000 cut starting this year. While the outcry from the community coalesced on Monday night at a City Council Meeting, agencies that rely on Mental Health Board funding have been vocalizing concerns for months. In May groups like Impact, Connections for the Homeless, and Peer Services all took to social media to ask Evanston Community Members to fill out Priority Based Budgeting Surveys. The survey results found that mental health was a top priority for Evanston residents; however, regardless of the results, major cuts of $250,000 to the Mental Health Board continued to move forward. As a result, Patrick Keenan Devlin, Executive Director of the James B. Moran Center Advocacy Center, led an effort to unite benefitting agencies as advocates against the funding cuts. He brought together 15 agencies to sign a letter urging the city to reject any funding cuts to the Mental Health Board. The letter (linked below), signed by the agencies’ Staff and Board Leadership, cites the collaboration in the Evanston area and the priorities of the city’s residents. “Collectively, we provide critical services that protect and promote the mental health and welfare of vulnerable children, youth, families, and seniors. Our impact is valued by the entire community. As reflected in the 2019 Priority-Based Budgeting Resident Survey, residents prioritized funding for the Mental Health Board over all other city services. The cut to the Mental Health Board is not only harmful to our residents, but also is not reflective of our community’s values, priorities, and commitment to equity. Right now, it looks like the groups collaborative efforts are working. The City Manager changed his recommendation to restore $100,000 to the Mental Health Board's funding, representing now a $150,000 cut instead of a $250,000 cut. Despite the good news, agencies have no plans of quieting down and it seems they still have a ways to go in their fight for funding. 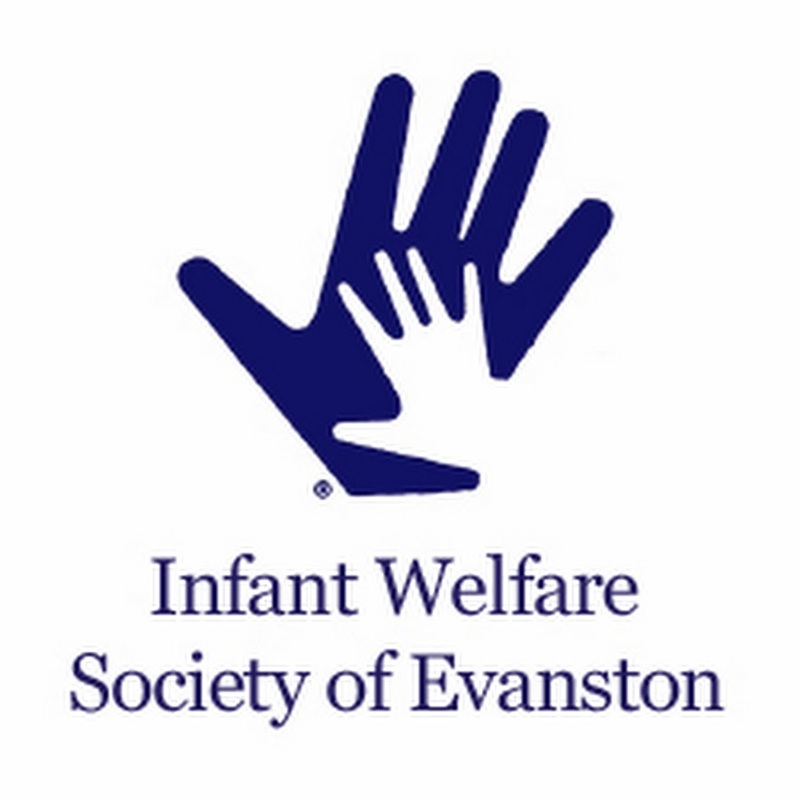 Read the letter to Mayor Hagerty and Aldermen of the Evanston City Council here. This year for World Mental Health Day, Impact staff shared some of the reasons that it is important to cure stigma. The negative effects of stigma are severe and far reaching. Check out the pictures below to see what some of our staff shared. Summer is wrapping up, and many are prepping to get back in the swing of things with school. If the thought of going back to school fills you with dread and anxiety, you’re not alone. If something just doesn’t “feel right” and you aren’t sure why, you may be dealing with a mental health condition. If you’ve dealt with traumatic events in your life, that may be a contributing factor. Did you know that half of all mental health disorders begin by the age of 14, and about 75 percent begin by the age of 24? But it’s also important to know that mental health issues are common and treatable. Just like physical health, taking care of mental health struggles early can help to prevent more serious problems from developing in the future. If you are concerned that you or someone you know may be experiencing a mental health problem, it is important to act before Stage 4. Start the conversation. Seek help from a trusted adult. Remember there is nothing to be ashamed of and that there is help and hope. Don’t know how to start the conversation? MHA has tips and information to help get you started at bit.ly/ tips4talking. 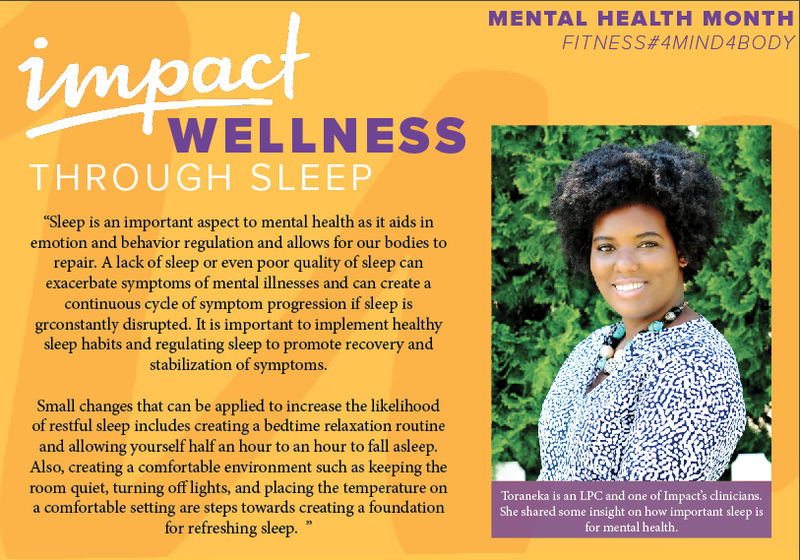 Toraneka, one of Impact's clinicians shared discussed the importance of sleep and how we can all get a little bit more of it! Fallon, one of Impact's clinicians, shared some of her thoughts and tips on how the gut and brain work together and impact mental health. To celebrate mental health month one of Impact's clinicians, Taylor, shared her passion for fitness and the effects that exercise has on mental health! On May 8th, 2018 Impact hosted mental health agencies in the Evanston area for a panel discussion on collaboration in mental health care. The panel discussed the importance of collaboration as well as challenges that may arise and ways that we can all work together more effectively. Impact's nurse, Maria Moreno, shared her knowledge on the effects that diet and nutrition have on mental health. While what you eat is commonly associated with weight and physical health, it has a very direct effect on your mental health as well.